This very beautiful canal is one of the most popular Waterways in Europe, and includes the Chirk Aqueduct an impressive structure built by Thomas Telford, which is 70 feet high, and beside it at 100 feet high is an impressive Viaduct built in 1848 to take the Shrewsbury & Chester Railway across the valley. The Chirk Tunnel is 1,377 feet in length, and once through this you can moor up and walk to Chirk Castle, a 700 year old Castle managed by the National trust. Ellesmere is a busy 18th century market town with delightful pubs and restaurants, also a variety of shops. Cruise through the open countryside until bridge 43 in the village of Platt Lane. Ellesmere is a busy 18th century market town with delightful pubs and restaurants, also a variety of shops and a Co-op. You can moor along the canal or down the Ellesmere arm, off to your right. From Ellesmere the country once again becomes quiet and rural until you pass the Montgomery canal at the Frankton Junction. This canal is restored for about 7 miles. To enter the canal there are 4 locks called the Frankton Locks, and these are only opened by a lock-keeper between 12-2pm (Please check hours when booking). 48 hours notice of passage is required. Only boats with a booking will be allowed through the locks. Please note that no passages will be allowed outside of the published hours. To book a passage call 01606-723800 during normal office hours from Monday to Friday. If you want to stop off there is a pub coming up after a tricky bridge (No 4)- the Narrow Boat Inn, just before the Maestermyn Marina at Whittington. Alternatively there is another lovely canalside pub at bridge 11, the Jack Mytton Inn, Hindford, both serve good food & beer. A bit further on, after Bridge 15, there are some very posh moorings outside the Lion Keys Pub & restaurant, just before you go under the A5 road. There are 20 moorings for customers. Jessop, it is a practise run before you get to the Pontcysyllte Aqueduct, but it is very beautiful in itself, and crosses over the River Ceiriog. 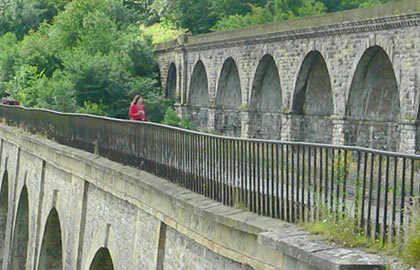 It is not as frightening as you would think, with spectacular views of the River cascading down the valley below, and the Chirk Viaduct above you, as the aqueduct is only wide enough for one boat, make sure there is no boat crossing before you go over it. After the tunnel moor up & you can walk back into Chirk & explore the town which has many historical buildings and to help you see them a fascinating town trail has been devised. If you want to first visit the fantastic medieval Chirk castle moor up just after Chirk Tunnel , walk along the road westwards (right) to the castle gates, it is about a 20 minute walk but well worth it. This magnificent 700 year old fortress was built by Edward the 1, and has family apartments, state rooms, servants quarters and dungeons which can be viewed. It is 5 hours cruising to here from Ellesmere. Instead turn around at the next turning circle which you will reach very shortly, or if you miss that turn in the entrance to the marina, and then go back through the tunnel and over the aqueduct and moor near the first pub in England, The Bridge Inn, before Bridge 21. You can still walk to Chirk from here, but it is farther from the castle. 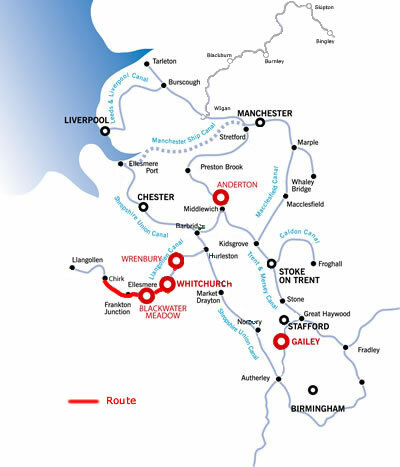 It is 9.75 hours back to the marina from Bridge 21, so you can cruise that in a day, or moor up somewhere after Platt Lane & set off early on your day of departure and cruise for an hour or so to get to Whitchurch marina. Note- Blackoe bridge 40 is an hour from the marina.